Blue Spruce Lodge: 340 ft of Lake Frontage, 80-ft wide Sandy Beach, Accessible! IMPORTANT! PLEASE DO NOT CLICK REQUEST TO BOOK! INSTEAD, click "ASK OWNER A QUESTION" -- it's under the Owner Photo and name "Ted Gogol". BEFORE we can accept a reservation we require information about your group to help ensure that our property will be a good fit for your needs. Please ignore the VRBO language about no refunds... their system won't remove the statement however it does not apply to our properties - the rental agreement that we both will sign will be in force and it includes our standard cancellation policy. VRBO's new format of their Rates section makes it impractical for us to input every possible rate combination for 365 days a year. The rates that VRBO automatically provides are often incorrect. Our apologies - we provide exact quotes in our responses. Welcome to our brand-new, 5,200 sq ft, 11-BR, 12-BA, wheelchair friendly Blue Spruce Lodge single family home on 340 feet of lake frontage on Stone Lake! To create one of the most comfortable, feature-filled, accessible lakefront vacation homes available in southwest Michigan. Its design incorporates over 8 years of excellent ideas from Guests who have stayed in one of our 3 other Stone Lake vacation homes. Please see below bullet point list of features. With the Blue Spruce Lodge's first reservation on Labor Day 2018, we have just a handful of VRBO Traveler Reviews. However please take a look at the 170+ VRBO Traveler Reviews for our 3 other vacation homes at Stone Lake: VRBO Property Numbers #325883 (7-BR, 7.5-BAKnotty Pine Lodge), #262334 (7-BR, 6-BA Woodlands Lodge) and #890604 (9-BR, 8-BA Cedar Lodge). Our policy of following the Golden Rule in Guest relations has paid off - 99% of these 170+ Guest Reviews give our properties, and us, VRBO's highest 5-star rating. * 5,200 sq ft of finished living space with knotty pine tongue and groove planking covering all walls and ceilings (giving it a very warm and inviting "lodge" feeling) with one exception: Special sound absorbing materials and construction techniques have been used in the BR ceilings on the walkout level to maximize their sound-deadening properties. * Zero steps or sloped path to access its private 80-foot wide sandy beach with a gentle slope into the water. Safety fencing will surround the house with a gate to access the beach at the east end of the property. * 11 BRs and 12 Full BAs - with 3 of the BR-BA suites on the main floor and 8 BR-BA suites on the walkout level. * The 5 wheelchair friendly BR-BA suites have 3x5 roll-in showers, drop down grab bars on both sides of the commode, knee room 36" counter sinks, and generous floor space for expanded maneuvering room -- enough space to use a Hoyer Lift. Bonus for parents of toddlers: These 5 large roll-in showers make a great spot for Pack-N-Plays at night. * A Bruno chairlift makes both the walkout and main levels accessible to everyone. *All 11 BRs have Queen beds have comfy mattresses with 3-inch thick Novafoam memory foam/gel toppers. Five of the BRs also have a Twin Bunkbed, with two of the BRs having both a Twin Bunkbed AND a Full Bunkbed -- super sleeping area for a cousins' slumber party. * The Kitchen is open to the Great Room and has 2 full size fridges (both with ice-makers), 2 stoves, 2 ovens, 2 dishwashers, and a generous pantry cabinet. There is a 3rd full size fridge in the Gathering-Game Room to keep beverages cold and conveniently nearby. * The wide-open Great Room has a vaulted ceiling and includes the Kitchen, Dining Area and a Gathering Area. The dining area features a 60" x 120" custom solid wood dining table that may be separated into two square tables with seating for 24. With barstools at the adjacent Bar-Buffet Counter and sofa seating area, 38 people may be seated at one time for meals all in one space. *The Great Room features a U-shaped Conversation Nook with comfy seating for 8 that is adjacent to the dining & kitchen area; it has a 55" smart 4K TV. * At 885 sq ft the main level Gathering-Game Room at the far west end of the house is generously proportioned and features a 13-foot vaulted ceiling, new slate pool table, new ping pong table, new basketball arcade game, new 12-foot HD projection TV w/ high-end Klipsch home theater speaker system (fills the entire space with distortion-free sound -- even at higher volumes) , full-size fridge, 7 sofas each over 7-feet long, plus Bistro tables. A full BA is just down the hallway. * The Gathering-Game Room has a custom sound deadening wall to acoustically separate it from the rest of the house. This 9.5-inch thick wall utilizes double layers of 5/8-inch drywall glued together with special sound absorbing adhesive between the layers of drywall, mounted on alternating 2x4 studs using 2x6 sill plates, with the wall cavity stuffed with 6 inches of sprayed cellulose insulation, with both sides of the wall then topped with 3/4 inch solid pine planking. * The bedroom suites also feature sound-deadening walls with extra thick 5/8-inch drywall, sound absorbing adhesive, and insulation in the wall cavities -- all under a layer of 3/4-inch knotty pine planking. The ceilings in the walk-out level BRs have custom sound-deadening materials. * The cozy TV Room on the Walk-Out level facing Stone Lake has 2 reclining loveseats plus a reclining sofa - with a 55" 4K Smart TV. 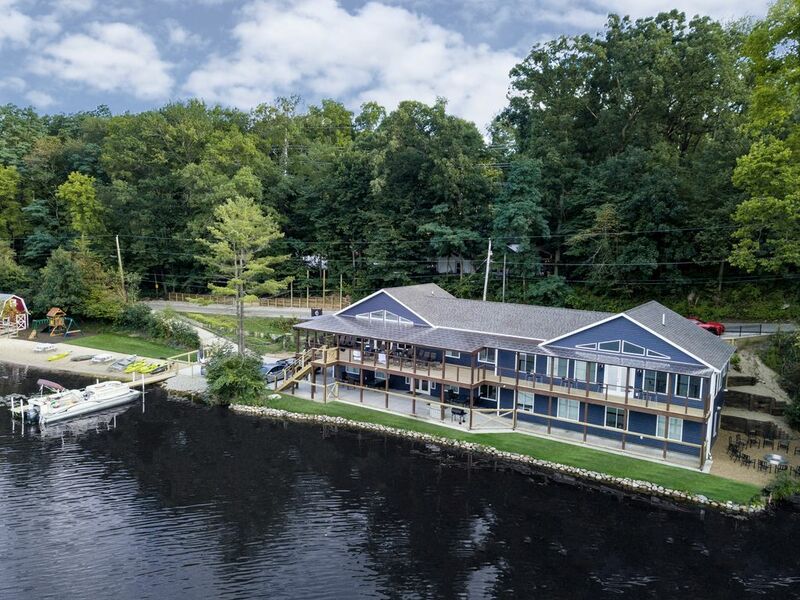 * The main level Covered Deck measures over 1,000 sq ft and has outstanding views of Stone Lake - just 15 feet away - and features 4 dining tables with 30 comfortable "springy" padded deck chairs, bar stools. * Comcast Xfinity's fastest "Extreme" cable Internet service combined with a custom Wifi Mesh network with multiple Access Points results in strong Wifi signals throughout the house, deck and the grounds. * A fun playscape for the little ones is near the beach at the east end of the property. * A basketball hoop - easily adjustable from 10' down to 7' without tools - is right at the house. * 15+/- bikes - a mix of adult and kid's sizes - for Guests to enjoy on the trails in our private 47 acres of woods and along the quiet streets of the Village of Cassopolis. * Concrete driveway parking for 4-6 cars right at the house at the walkout level, with additional off-street parking for 8-10 more vehicles. Barrier-free entry to both levels of the house; a Bruno chairlift connects the walkout level with the main level. * Brand new HVAC system (2 units actually) provides heat and central AC to all 5,200 sq ft of living space, with 5 zones to maximize one's comfort. * Two super high-capacity instant hot water heaters utilizing a recirculation pump provide a never-ending supply of hot water. * A Firepit overlooks Stone Lake and has ample seating. * Boat dock has barrier-free, level access from the concrete parking pad just 45 feet from the house. * A 25-foot Pontoon Boating Pkg is available - the Pkg includes 10 gals. of fuel, orientation session, 7 sit-on-top kayaks (5 adults, 2 child), and a row boat. Many guests enjoy reserving the optional Pontoon Boating Pkg -- it's great fun to get out on the lake – and the little ones just love playing 'captain' steering the boat. The 25-foot Pontoon Boat also makes for a great mobile swimming platform, and sunsets are glorious as it's so peaceful to be out in the middle of Stone Lake and just slowly drift and watch the sun drop below the western horizon. And if anyone likes to fish - that's what Stone Lake is famous for! We include in the rental of the Pontoon Boat a personal orientation session so that the Pontoon can be operated safely and with confidence. Also included is 10 gallons of fuel -- usually enough for a week. PLEASE DO NOT RESERVE OUR PROPERTY without first submitting an inquiry to us, as we require information about each group. Thank you for your understanding. The Blue Spruce Lodge has sleeping capacity of up to 40 in beds (determined by ratio of adults-children), a few more using sofas or bring a couple of inflatable mattresses like an Aerobed. 1) Woodlands Lodge: 7-BR / 6-BA / 450 sq ft Gathering-Game Room / 350 sq ft Covered Deck / Lakeside Log Cabin - VRBO #262334. The Woodlands Lodge is 50 feet from the Blue Spruce Lodge. 2) Knotty Pine Lodge: 7-BR / 7.5-BA / 550 sq ft Gathering-Game Room / 430 sq ft Covered Deck - VRBO #325883. The Knotty Pine Lodge is about 1,000 feet from the Blue Spruce Lodge. 3) Cedar Lodge: 9-BR / 8-BA / 845 sq ft Gathering-Game Room / 670 sq ft Covered Deck - VRBO #890604. The Cedar Lodge is about 900 feet from the Blue Spruce Lodge. For large gatherings that may include Guests with mobility challenges and other special needs, the generous size and accessible accommodations of the Blue Spruce Lodge will make memories to last a lifetime. If you need sleeping capacity for 25-40 people with a bathroom for every bedroom (plus an extra full bath), with multiple gathering areas including dining and game room spaces that can comfortably accommodate the whole gang, we suggest you consider the Blue Spruce Lodge. Where to start? Wheelchair friendly, zero steps to access its private gentle-slope 80-foot wide sandy beach, situated on 265 feet of lake frontage, 11 BRs / 12 BAs / 885 sq ft Gathering-Game Room with a bonus 140 sq ft "Kid's Play Loft," 1,000+ sq ft Covered Deck, 12-foot HD projection TV, knotty pine planking throughout for that "up north" feeling, completely stocked kitchen, multiple stoves, ovens, refrigerators, dishwashers...the Blue Spruce Lodge incorporates most everything we've learned from our Guests in over 8 years of having a vacation rental property. toilet, shower, Wheelchair friendly with 3x5 roll-in shower, grab bars, etc. toilet, combination tub/shower, Hallway FBA for the Great Room and the Gathering-Game Room. All 11 bedrooms have a private en suite full bathroom. There is a 12th full bathroom in the hallway that joins the Great Room with the Gathering-Game Room. This hallway FBA has a tub/shower - it's a convenient spot to give little ones a bath as it's not in a bedroom. Two large HVAC units provide central AC to all 5,200 sq ft. The HVAC system has 5 separate zones, each zone controlled by its own thermostat, for enhanced comfort (and to stop noise transmission). Full size washing machine for Guest use in the utility room on the Walkout Level. Full size clothes dryer for Guest use in the utility room on the Walkout Level. Parking for 4-6 vehicles at the house at the Walkout Level. Add'l parking along the street at the Main Level for another 4-6 vehicles. Even more parking for Summer 2019. Comcast Xfinity's fastest "Extreme" cable internet service is connected to a Mesh network with multiple access points to provide high speed single network Wifi throughout the house, deck, grounds. Towels provided for all 12 bathrooms. Guests need to please bring their own beach towels. Not an elevator, but a Bruno chairlift connects both levels of the house. The Great Room's gathering area with sofas and loveseat serves as the living room. 2 refrigerators both with ice makers in the kitchen. A 3rd refrigerator with ice maker is in the Gathering-Game Room. Yes house has a microwave. 3 coffee pots: 2 standard coffee brewers, 1 Senseo quick brew single cup coffee maker. 2 stoves, 2 ovens, 2 refrigerators with ice makers, 2 dishwashers, 3 coffee makers, 2 four-slice toasters, crock pot, electric griddle, blender, fully stocked with LOTS of pots, pans, cutlery, etc. Solid wood 60" x 120" table may be pulled apart to seat 24 - extra dining chairs provided. Add in the Bartop Counter and the sofa seating area - brings total seating to 36 in the Great Room. 12-foot HD projection TV in the Gathering-Game Room. Plus a 55" 4K SMART TV in the Great Room on the Main Level, and a 55" 4K SMART TV in the Gathering Room on the Walkout Level. Comcast Xfinity TV service popular channel pkg. Both 55" TVs have Sound Bars. The Gathering-Game Room has an upscale Home Theater audio system. Blu-Ray. Please bring an HDMI cable. This 885ft² space is a Game Room AND a Gathering Room: Pool Table, Ping Pong Table, 140ft² Kid's Play Loft, 2-person Basketball Arcade, full-size fridge, wet bar, 7 full-size sofas, Bistro tables. Play area adjacent to the sandy beach. 5 Kayaks are included in the optional Pontoon Boating Pkg, along with a row boat. Mix of adult and child sizes to ride on the trails of our private 47 acres of woods (shared with our 3 other vacation homes) and in the Village of Cassopolis. Optional Pontoon Boating Pkg available. The Covered Deck is over 1,000ft² and is just 15 feet from the water's edge, with lots of comfy seating and dining tables. The optional Pontoon Boating Package comes with a 25-foot pontoon boat, 7 kayaks (5 adult, 2 child), 1 row boat, 10 gallons of fuel, and an orientation lesson. Swiss Valley Ski and Snowboard Area in Jones, Michigan is just 20 minutes away. Numerous public golf courses in the area, nearest just 5 minutes away. We can provide info! Barrier-free entry into the house at both the Main Level and the Walkout Level. Five of the BR-BA suites have wheelchair friendly BAs with 3x5 ADA compliant roll-in showers, drop down sturdy grab bars on both sides of the commode, knee room bathroom sinks, maneuvering room for wheelchair users. Zero steps or barriers on the Main Level and out onto the Covered Deck. Zero steps or barriers on the Walkout Level and out onto the patio, driveway, firepit, lawn, beach. A Bruno Chairlift connects the Main Level with the Walkout Level. This is a true luxury home. Thanks! We had a wonderful time at the Blue Spruce Lodge! Was a great layout for having multiple families with little kids. This place was great! We had a huge group and it was big enough for everyone! The only downside was the oven. It was a little out of date which made it difficult to cook but we made it work. Perfect stay for a business outing and we will be back again. Home is better than the listing. Great experience! They thought of everything when outfitting this incredible home! En Suites for each bedroom, sound proof theater, tons of seating, blankets, towels, kitchen needs..you need it, they have it! Great location for our company team retreat. Very clean and well maintained. Owners were communicative and easy to work with when setting up our stay. Would recommend for any large group. Perfect for our yearly Friendsgiving gathering! Lots of space for cooking and socializing and for kids to play. There’s also a good amount of privacy as each room has its own bath. We enjoyed using the firepit and taking a stroll through the woods. Everyone in the group loved the place and look forward to returning in the future.